Hello! How are things in your little world? Have you got out your Christmas decorations yet? Put the tree up? Bought gifts? Crafted anything special? I'm not trying to pressure you, just asking how things are going is all. We are getting our tree this weekend. We get ours from a little family run tree farm right around the corner from us. Just about all my presents are bought...just need to get wrappin' now and I'm just about done with my crafting too. Working on finishing touches and such. December is cooking and baking time in our house. I don't want the pressure of going to any stores or fighting traffic. I vowed last year to make all our Christmases from here on out more simple and homemade and I'm stickin' to my guns on that one. One of the things I love most about this time of year is all the great things that come out of my oven. I found this recipe on Plain Chicken.com. Steph has a lot of really great recipes. This one caught my interest. This was titled Jim 'n Nicks Cheesy Biscuits. I have no idea who Jim or Nick are. Maybe it's a restaurant in another part of the US? Regardless...they make a delicious biscuit (vanilla excluded here though). 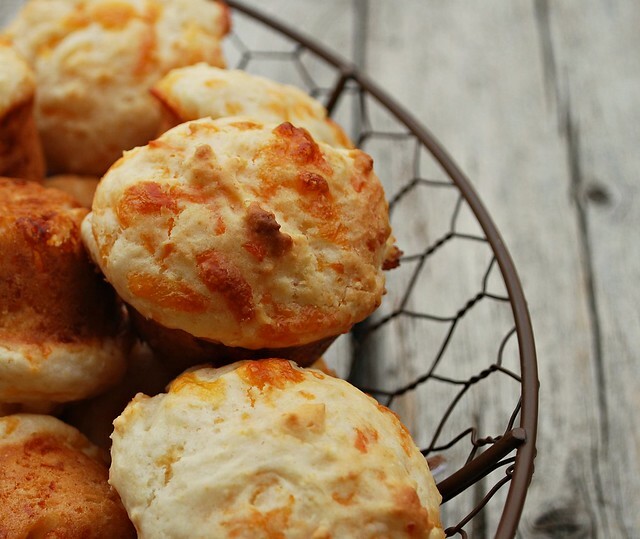 Little mini cheesy biscuits that are no knead! No knead! You can thank me later. These took like 3 minutes to put together and 15 minutes to cook. My teenage boys were eating them faster than I could make them. So good! The original recipe called for 1 teaspoon of vanilla. I omitted it and I cut down on the sugar a bit too. They really came out great. Preheat oven to 425. Stir together all the ingredients until just combined. Don’t over mix! Scoop into greased mini muffin pan. Bake at 425 for 12 – 15 minutes or until golden. We have the outside of our house decorated and the inside will get done this weekend. I am totally not a crafter, but last weekend I painted and modge podged my daughter a painting for her room...it's soooo cute. Love these little biscuits. Yay for bisquick and it's interesting that they are a little sweet. I probably would have left out the vanilla, too, but I am curious what they would taste like with it in, too. Great easy recipe! No need to knead biscuits anyway. Kneaded biscuits are heavy like hockey pucks. This recipe looks good though! Paul and I continue to argue over getting a real tree or a fake tree this year. He's a purest, while I'm tired of cleaning up sap and pine needles. Before you know it, Christmas will have come and gone. But the truly ironic part is that I'm Jewish and I want a tree more than he does, the Catholic guy. Things are good in my little world! I'm so glad to see they are in your world, too. All I want for Christmas is time with loved ones and a little down time to do crafty things. Though my craft time is more like thumbing-through-magazines and dreaming time. You are so organized this year! I have a day all to myself today, so I'm going to use you as my inspiration and get cracking. 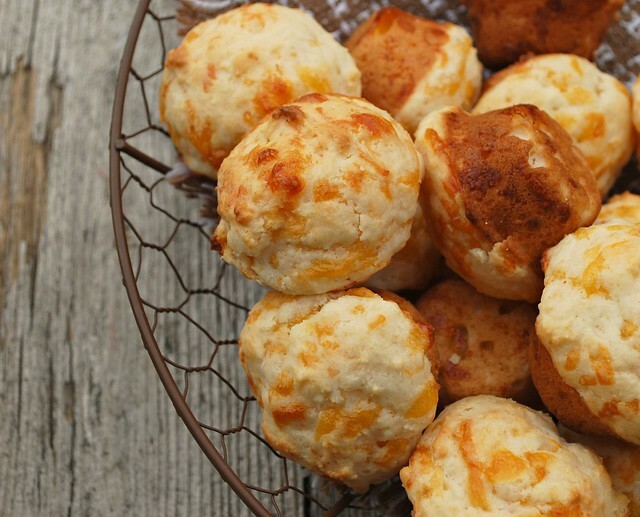 These cheese biscuits look so moist and bite-able and I love your little basket. I agree with Becki that I am too curious about that vanilla, too! Jim and Nicks is a BBQ restaurant and they do have the best bisquits. They leave a basket of them on your table. They have just a touch of sweetness in them. The one I know about is in Colorado. made these to go with a pork roast and salad last night. . .YUMMY and EASY:) Thank you, especially for the beautiful pictures on your blog. Know this is an old post but came across this recipe and wanted to try it. but do I have to use buttermilk?